No matter how straightforward Popunder advertising looks, it’s not such an easy tool to master. Using it the wrong way can not only burn your budget, leaving it as a sun-scorched desert but also alienate the customers and potentially turn them off for good. It doesn’t have to be that apocalyptic. Today, we are spelling out how Popunder can be transformed from a dull, outdated advertising technique to a powerful and versatile marketing instrument. 1. Didn’t get the right results on Popunder? Previously, some marketers believed that the more frequently ads would be shown, the more impressive results they would enjoy. (Actually, this strategy can still be used in certain cases like pre-event marketing). Having a vague understanding of how the user experience should be, marketers were hitting the same audience with the same ads repeatedly. Too frequent ads were annoying the audience. The value of advertisers’ offers was outweighed by the negative emotions from persistent advertising. All that was translating into poor results: low conversion rates and high costs. So, let’s see what we can do now to fix this. 2. How to make it work? Over the years, we’ve noticed that certain Popunder campaigns advertisers ran, were simply stellar, while others were underperforming. We started analyzing the factors that contributed to great results, and, au contraire, the ones that dragged campaigns down. We assessed only the technical aspects, as creatives are a completely different story. Even though it may not sound groundbreaking, this strategy proved to be extremely effective – we’ve tested it ourselves on various verticals and GEOs. Why does lower frequency work better for Popunder? If you allow higher frequency, you spend your entire budget on the same people, showing them one ad time after time. Does that contribute to reaching a bigger audience? Not really. What happens if the frequency capping is set to 1 impression per week? The system would have to find you MORE unique users, drastically expanding your reach. Note: The frequency capping would depend on your targeting settings and the audience size. If your audience size is too small, you would need to increase your frequency. Obviously, lower frequency doesn’t work on its own; we also need a precise prospect identification process. Why do you need a prospect identification process? Before proceeding to the next step of our strategy, we have to understand what users are actually interested in the offer. Any click on the landing page because people usually don’t engage with offers that they find unappealing. Time spent on the landing page: more than 10 sec. If a visitor is not interested, it’s very likely that the landing page would be closed in a few seconds. Once you’ve decided on what event you are planning to track – you can embed the retargeting pixel and start building a custom audience of prospects. Having a custom audience gives you extra room for manoeuver – you can decide how to direct the leads to the best conversion point, how often and when to contact them. How do you benefit from this strategy? In a nutshell, you save money and get quality leads. And here’s a more detailed answer. First, you launch a campaign to reach as many users matching your targeting settings as possible. The frequency is set to low (1/168), allowing you to reach only unique users. 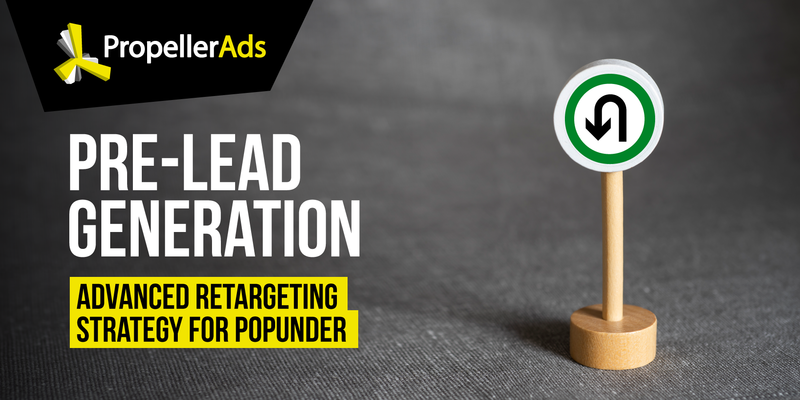 Inexpensive Popunder campaign helps you scan the market for potential leads. Using retargeting, you find the visitors that are interested in your offer. In other words, the budget goes only to audiences, which have the highest chance to convert. Enough with the theory – let’s move into real cases! After the first part of the strategy was complete, we could see the significant growth in conversion rate (9.3 times), fueled by the retargeting campaign. Users were directed to the same landing page, introducing them to a new game. The focus on the “Special offer” page helped to push the CR higher (1.8 times) on the retargeting campaign and reach those hesitant users, who were not ready to convert after the first encounter with the brand. In this case, the retargeting campaign pushed the number of conversions even higher (CR 9.4 times bigger), comparing to the initial “Scanning the market” campaign. The landing page, used for retargeting, provided additional information about the app and offered a direct download link. While the first landing page was focused on content, arousing visitors’ interest; the landing page chosen for the retargeting campaign was all about trading benefits. This strategy helped to increase the conversion rate (5.7 times) and find quality leads. Ready to play with the new strategy? By the way, if you need help or further information on how to implement this pre-lead generation strategy, you can always contact our support team via Live Chat or your account manager.